Fayston, VTGreat for 2 Families! 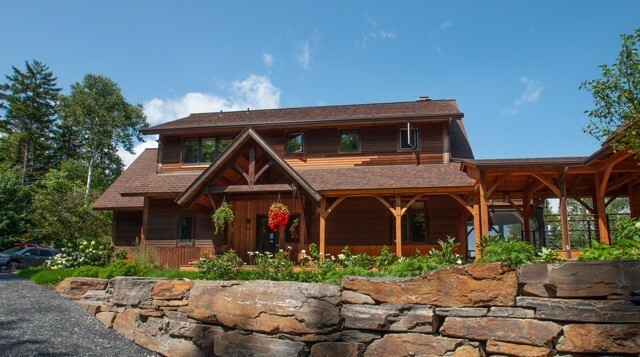 A GRAND HOME FOR YOUR SKI SEASON STAY. Energize your spirit! This is a house about soaring space and a property about space, trees, water and views. Forty two foot catherdral ceiling with massive wood burning fire place. The home has an open plan with living/dining/kitchen, library/TV and office on first level. There are 4 large bedrooms with full baths on second level. Two bedrooms, bath and lounging/entertainment area ensuite on third level. Oak post&beam on three levels. Every creature comfort is present in the home with fireplace seating in the great room, inviting dining spaces, wet bar and plumbed-in Faema expresso machine, A chef's kitchen with large island and so much more. Plenty of space for friends and family with ping pong and other recreation in the full finished basement. Meandering wooded trails & logging roads traverse the property. There is a spring fed pond and Kew Brook runs through the property. 130 acres of conserved land overlooking the Mad River Valley. Two minutes from Historic Downtown Waitsfield yet private and secluded. This fabulous estate is also for sale at $1,550,000. This wonderful Post & Beam /Adirondack style home sits high on 3.5 secluded acres directly across from the Sugarbush/Mad River Ski Resorts and 11 minutes away by car. Enjoy outstanding privacy and mountain views from a 3400 SF Main House and a recently completed 1100 SF Guest House with an attached two car garage. All tastefully appointed. Quality Craftsmanship throughout. 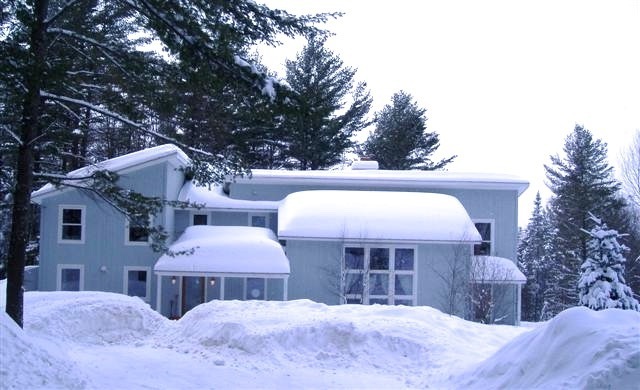 A fabulous winter retreat for family and friends. Also perfect for several couples! Enter the main house through an inviting foyer with a powder room and generous mudroom off to one side. The main living area incorporates a gorgeous chef’s kitchen, dining room, living room and TV/Den - all in an open floor plan surrounded by windows that bathe the space in natural light and provide outstanding views of the mountains. Soapstone and granite countertops, high end stainless appliances and a large island/breakfast bar in the kitchen, a handsome fieldstone fireplace in the living room, wide pine flooring throughout. Across the entire back of the house is a lovely open deck. To the side is a screened in covered porch. Upstairs, find a fabulous master bedroom suite and two more bedrooms, each with their own bathroom. On the ground floor is a recently completed fitness room/gym with a fabulous hot tub on the stone patio just outside the wall of French doors. From the hot tub, enjoy the same gorgeous mountain views as the main floor above. At night, pick out the stars from the clear Vermont skies. The new guest house sits above a two car garage and is a complete studio and living space. Exquisite post and beam construction, open floor plan, floor to ceiling windows, gorgeous light and mountain views. Includes living/dining/kitchen, European gas fireplace and 3/4 bath on main floor plus a sleeping loft with king size bed. All beautifully constructed and appointed! Imagine holidays and winter weeks here in the Sugarbush/Mad River Valley where you will enjoy an unrivaled “Pure Vermont” experience! Sunny top floor of duplex apartment available for 2017/18 Ski Season. Great location on German Flats Road, on the shuttle bus route between Sugarbush South and North (Glen Ellen). 3 bedrooms, one with a queen sized bed, one with a full sized bed and the third with four bunks. All new kitchen with breakfast bar, 30' x 18' living/dining combination with wood burning fireplace. Freshly painted and new carpeting throughout. Washer/Dryer and mud room entrance. 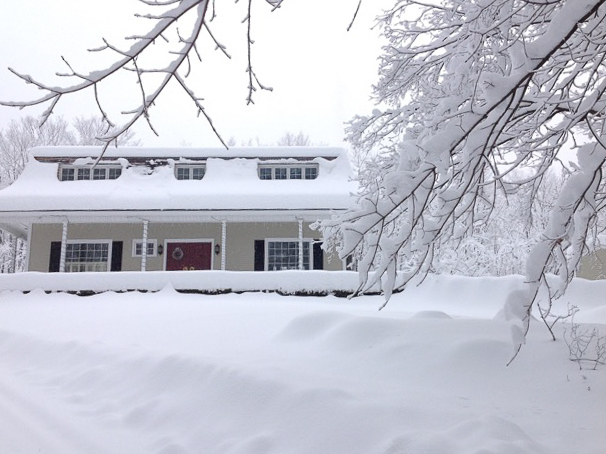 Basic Cable, Internet, phone and snow plowing included. Propane and Electric not included but estimated at $1200/season. Well-behaved pet would be considered. Ski Season Rental = $10,000 total. Yearly lease available November 1 at $1500/month. Warren Village, VT580 Main St. This sweet 2 bedroom, 2 bath home is located in the heart of Warren Village overlooking the Mad River and the Covered Bridge. Sunlight pours into every room of this house! A fabulous new kitchen sports a large island with seating for four, SS appliances, 5 burner gas cooktop and beautiful quartz countertops. A separate, built-in bar with cherry cabinetry and mirrored back is a handsome and convenient design element. Sliding glass doors open to a generous deck with a view of the river and where outdoor grilling can take place all winter long. The first floor is completed with the dining room that seats 6, a full bathroom, and the living room that has windows on three sides. The second floor has two bright and sunny bedrooms, each with a queen bed. There is also an open dormer off the hallway with a sleeper sofa that can be opened up to sleep an extra child or two! The second full bath is on this floor and is shared by both bedrooms. Outdoor ski locker and on site parking for two to three cars. Nice level backyard by the river. Great for making snowmen and snowball fights! An easy walk to the Warren Store or the Pitcher Inn and just minutes from the ski slopes. This well maintained one bedroom/one bath apartment lies in the heart of Warren Village, a stone's throw from the Warren Store, The Pitcher Inn, the Library, and of course the Mad River. Enjoy your own separate entrance, parking and a private side porch plus a back yard with a small deck with a gas grill. Full sized bed in the bedroom. Futon and TV in the living room. Kitchen has nice counterspace, good cabinet storage, seating for two, and sliding glass doors to a small deck with a gas grill. 3/4 bath and good closet storage. Approximately 400 SF in all. No washer and dryer. Rent includes all utilities. Perfect for full time single or vacation/weekend couple.